Afghanistan’s population is approximately 30 million and most of them are rural poor, with no access to reliable, modern forms of energy. The per capita power consumption (as measured from grid supply) in Afghanistan is among the lowest in the world: about 27 kWh per year and less than 10% of the population is connected to the Government owned electricity grid. The generating capacity is mainly hydro-based with total hydro potential estimated to be about 23,000 megawatts (MW). Moreover, rural areas are virtually un-served and the supply there, unless attached to the Ministry of Energy and Water (MEW) network, comprises mainly generator sets and micro hydropower plants (having capacities below 500 kW ). These are privately owned, community-owned or belong to Government offices for self-consumption. As the power sector drives the economic growth, the Government has accorded high priority for its development and it has promulgated Electricity Sector Policy (Appendix 1) in 2003. The Government has depicted electricity as a vital service for the economy in the Policy document. The vision of the Government for the electricity sector is, “By 2010, to evolve into autonomous, financially viable enterprises providing reliable, low-cost electric service to all Afghan citizens in an environmentally responsible manner, consistent with sound business practices.” To implement this vision, MEW has planned ambitious projects with the goals of rehabilitating its existing infrastructure, increasing its generation capacity through participation of the private sector, increasing its revenue through enhanced and effective billing and collection and loss reduction procedures, and all associated with the pressing need to develop institutional capacity and tools to manage the electricity infrastructure. The state utility, Da Afghanistan Breshna Moassesa (DABM), is responsible to MEW for the operation and maintenance of the country's generation, transmission, and distribution assets, as well as for the sale of electricity it produces. Currently the power system in Afghanistan comprises several regional grids which are not interconnected. There is no national uniform tariff and it varies widely depending on the source of power . However, the cost recovery level is estimated at only 50% on average for the country. 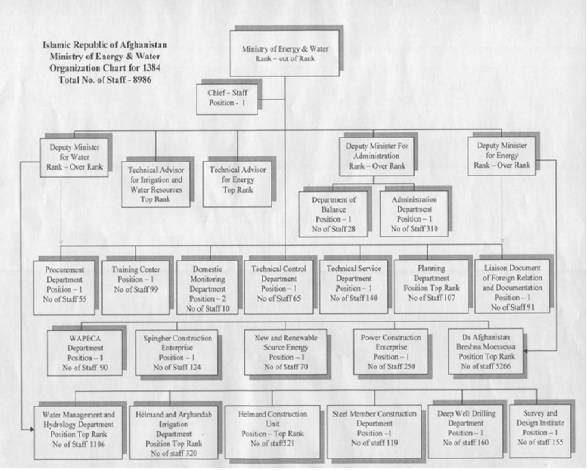 A larger scale private sector participation in generation, transmission and distribution is not feasible under the current situation, given the DABM’s poor organizational systems related to its personnel data, its accounting systems, technical information, billing and collection, and the current level of political and security risks in Afghanistan. A legal basis for private sector participation has to be designed, developed and implemented. Moreover preparatory work is required to create the basic information and support before any private participation scheme can be attempted. In the frame of the project “Improvement of the Energy Supply, Afghanistan” German Technical Cooperation requires the services of Consultants to assist in the development of political and institutional frame conditions for the implementation of a reliable energy supply, in particular the elaboration of a legal basis for private sector participation in power generation, distribution and purchase in Afghanistan. • Screen the sector and collect all necessary and available information regarding Rules and regulation for the access of private, independent power producers (IPP) to Afghanistan’s energy market. • Based on the existing situation elaborate main headlines on what is necessary for the implementation of a socially balanced tariff system for Afghanistan considering local conditions and the participation of private power producers. • Identify main points that are to be considered in the Revision of the “Usage of Electricity Act” from 1986. • Identify main points that are to be considered in drafting a modern Electricity Act for Afghanistan considering rules and regulation for IPPs. • a short report on main headlines on what is necessary for the development of a socially-balanced tariff system for Afghanistan considering local conditions and the participation of private power producers. This study was conducted over an extremely short period of four days between a weekend and an extended Afghani New Year weekend. Lack of a business directory with telephone references also constrained the mission as the meetings were being set up simultaneously with some of the meetings taking place, even by sending people to the office premises with requests for the meetings. However, a number of meetings with key stakeholders could be held, notwithstanding the constraint. 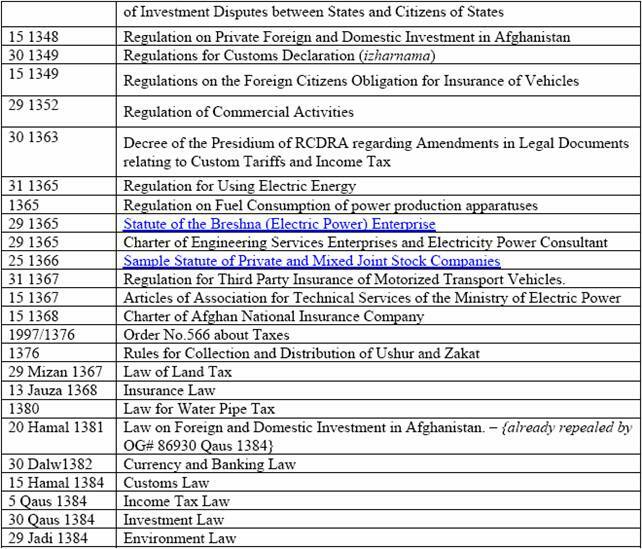 Similarly, a review of laws and regulations of Afghanistan for the access of private, independent power producers (IPP) to Afghanistan’s energy market was also constrained for lack of these in English language. The consultant succeeded in locating the “Usage of Electricity Act” from 1986 on third day of the series of meetings but it was in Afghani language and needed rendering it in Afghani. Thanks are due to the office of INTEGRATION for translating it at a short notice. It was imperative to peruse annual reports of DABM including financial statements, in order to conduct a study for the development of a socially-balanced tariff system for Afghanistan considering local conditions and the participation of private power producers. This activity was also constrained for lack of such annual reports. The consultant was required to conduct an evaluation of the existing laws and regulations for the access of private, independent power producers (IPP) to Afghanistan’s energy market after reviewing them. However, a full fledged review was not possible as most of the relevant body of law was in Afghani language. An unofficial translation of Law “for Using Electric Energy” from 1986 (Serial Number-607) into English was rendered by an official of INTEGRATION and an evaluation of the same is being made hereunder. Similarly, an analysis of the “Electricity Sector Policy” of 2003 also is being conducted in this section. This legislation defines and regulates the relationship between the utility and its consumers, like what accessories (including metering device, transformers, etc.) to use, permissible voltage range, categories of consumers, application procedure, penalty for delayed payment, mode of payment, etc. It even specifies that load shedding will be resorted to in case of low generation as well as during force majeur situations and there is also provision for uninterrupted supply of energy, if there is categorical provision for the purpose in the agreement with specific consumers. There is provision also for the allocation of losses between the distance of power net and meters. The legislation envisages underground cable network and prohibits construction entailing interference with it. There is a separate section devoted to regulation of use of electricity by each category of consumers. It has designated Afghan law for the settlement of disputes between the utility and its consumers. However, this law does not envisage private sector participation in electric business. The policy has articulated a vision for the Ministry of Water and Power (which has since been transformed into Ministry of Energy and Water ) which is for a limited time till 2010. The vision emphasizes “low cost electric service to all Afghan citizens” and also highlights the importance of being “environmentally responsible.” But the vision is silent about the partnership of both domestic and foreign private sector in the electricity sector. The main focus of the policy is rehabilitating existing infrastructure and it adds that generation capacity will be increased through the participation of private sector. The policy makes commitment to encourage and attract private sector involvement and mentioned it plan to develop a regulatory framework and to introduce law that would create an independent electricity regulatory entity. The policy has also laid out a plan to restructuring of the electricity sector entailing separation of utility functions (generation, transmission and distribution/sale of electricity) from sector policy and planning functions. The independent regulatory entity is expected to set technical, financial and operational performance standards and regulate the power sector. However, the policy is silent with regard to strategies that will be adopted to implement the policy. It also does not make necessary provisions to encourage the private investors to participate in the electricity sector. As electricity is a capital intensive venture needing longer term for the recovery of investment with a decent return, the policy should have laid down provisions to make private investors feel confident about their investment and to raise their level of comfort. It should have covered issues like water right, power purchase, facilities regarding rates, tax, duties, etc., if any, and so forth. Similarly, from the perspective of foreign investors, the policy also needs to make commitment regarding repatriation, visa, etc. The policy needs to be fully revamped as it does not even define the term “independent power producer.” Besides, the environmental legal system in Afghanistan is still in its infancy. No overall environmental law is yet in place covering, for instance, control of air-, water- and soil pollution, overall environmental planning, EIA, etc. Contrasted with other developing countries, Afghanistan has location-specific tariffs rather than a uniform national tariff. The average domestic tariff varies widely depending on the source of power. Generation source of Kabul, Kandahar and Badakhshan comprises of a mix of thermal, diesel and hydro. Government, holy places, shops, unregistered factories and NGOs pay Afg 10 per kWh while registered factories pay Afg 6 only in these areas. Similarly, households are charged at Afg 1.5/kWh for up to 300 kWh, Afg 4 for the consumption between 310 to 700 kWh and the rate is Afg 6 for anything over 701 kWh. Sarobi and Baghlan’s source is hydro only but the rate structure is exactly same as Kabul. Bulkh province is dependent on imports from Uzbekistan and it charges flat rate for households at Afg 3, shops are charged Afg 6 and the rest pay at the rate of Afg 8 kWh. Samangan uses diesel generators and also uses a flat rate of Afg 18 per kWh across the board. 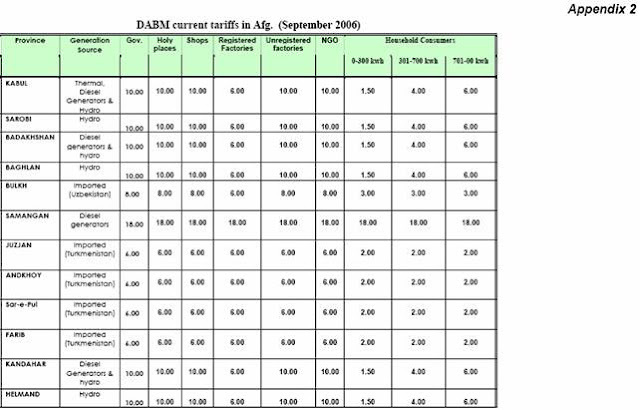 DABM imports from Turkmenistan for Juzjan, Andkhoy, Sar-E-Pul and Farib provinces and the rate is flat Afg 6/kWh. Main source in Helmand and Waedak is hydro and the rate structure is same as in Kabul. 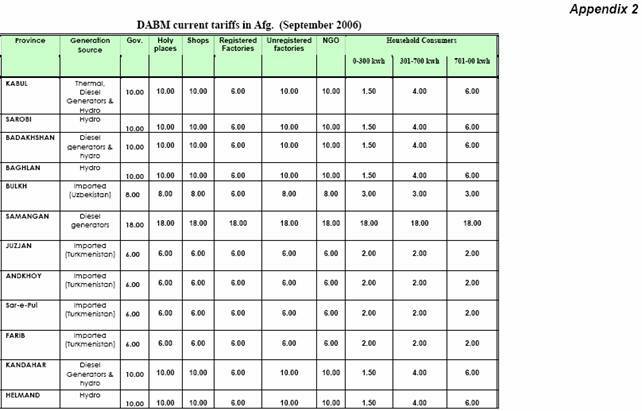 Although DABM uses diesel in Zabul the tariff is relatively low at Afg 6 for households and Afg 12 for the rest. It is imported from Iran and Turkmenistan for Heart and the rate if flat Afg 2/kWh for households and Afg 6 for all others. 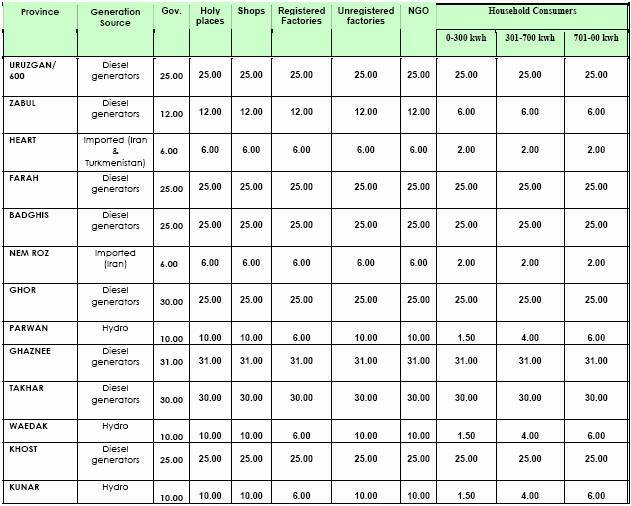 Diesel generators are used in Farah, Badghis, Khost and Paktia and the rate is Afg 25/kWh across the board. Although in Ghaznee too diesel generators are used, the rate is relatively high at Afg 31/kWh. From the above it is clear that there is no uniformity in the tariff charged to the consumers from one province to another – even when the source is same or similar. On the one hand this strategy could be helpful in recovering the cost of bringing electricity to the consumers but on the other hand there is no guarantee that DABM is even breaking even. Therefore, it is undoubtedly true that DABM needs to design socially-balanced tariff system for Afghanistan as a whole considering local conditions and the participation of private power producers. Private producers will never feel comfortable in setting up generation plants to sell electricity in bulk to DABM if its capability to pay (or its solvency) is questionable. For this purpose, the tariff needs to be both rationalized and streamlined. However, that is not possible unless exhaustive financial data and information was to become available. As mentioned above, the current policy document makes commitment to encourage and attract private sector involvement in the power sector. Mere a statement of commitment is not adequate. Necessary legal environment conducive for private sector participation in the sector needs to be created. The extant body of law in Afghanistan needs to be improved in following respects in order to attract private investment in the power sector. Hydropower development entails exploitation of natural resources, viz. water. Water tends to be a contentious issue even in tranquil country. Therefore, private investors need to be given clear indication as to how they will be afforded access to this natural resource. It can be on build, own, operate and transfer (BOOT) format under which the private developer will be required to transfer the assets created as such to the government upon expiry of the concession period. Nepal follows BOOT format and upon expiry of the license period, the power plant is envisaged to be transferred to government. It is recommended that Afghanistan also follows this format. The advantage of such a format is that upon expiry of the license period the government receives an operating power plant free of cost. The other alternative is “build, own and operate” (BOO) format in which the developer gets to keep the project. Proper legal environment for the hydropower development needs to be created by promulgating laws to regulate the concession. In other words, in the proposed electricity act (if a new act is to be framed) clear stipulation will need to be made about BOOT or BOO format. Besides allowing private sector to participate in the business of hydropower generation, even transmission network and distribution service have been opened for the private sector in other countries. Thus the BOOT or BOO concept could even be applied for transmission as well as distribution in Afghanistan, too. Another facet of the concession in the hands of a hydropower developer amounts to right over water in a specified area. This is regulated by licenses. The right as such also enshrines a guarantee under which the developer will be guaranteed that the water in the upstream area will not be diverted such that it will adversely impact her/his power plant, once constructed. For a hydropower project, each drop of water amounts to certain amount of energy which gets translated into a revenue stream. Undue diversion of water in the upstream areas will result in decrease in the plant’s revenue volume which will impact the feasibility of the project. Substantial decrease in the discharge could even result in financial insolvency of the power plant for failure to meet debt service requirement. The law on the anvil will have to guarantee the quantum of water to a hydropower developer based on its approved installed capacity. It is suggested that the law make provision for the issue of license for generation of power to a developer for specific site in which head, flow, coordinates of the site and other important salient features are specified. It is advisable that such licenses are awarded on a competitive basis under a transparent process. A hydropower plant is invariably located by a river and mostly such land is either public land or forest land. A private hydropower developer will need access as well as authority to use such land. The law will need to make provision for providing public land as well as forest for setting up the hydropower plant. There are times when even private land becomes necessary for a hydropower plant. The developer should be allowed to make arrangement for it on her/his own initiative – purchase or take on long term lease (for the duration of the license) from the private owner. In the national interest, if the private owner refuses to cooperate with the developer, then the law needs to have provision for the government to acquire such land in necessary quantum on behalf of the developer. Private investors all over the world dread CEN. The law needs to categorically guarantee against confiscation, expropriation or nationalization of hydropower plant and other properties of such belonging to such plant. Hydropower is a venture with high initial investment requiring long gestation period (construction period) and constitutes long term investment. Therefore, it is incumbent on the government to ensure full security of the hydropower plants. It is imperative for the law to make necessary provision for the security of the developer, her/his power plant and the employees working in it. Development of hydropower entails diversion of water and creates “dewatered area” in the specific locality. From the ecological perspective, complete “dehydration” of any locality is not advisable. Therefore, the law needs to make provision for “environmental flow” – the quantum of water that needs to be left in the river at any given time. Besides, during the construction period the works can result in adverse environmental impact. Therefore, the law needs make stipulation for conducting environmental impact assessment (EIA) – or initial environmental examination (IEE) for projects under specific size like small scale. Such a study also needs to make recommendation with regard to measures for the minimization or mitigation. Such minimization and mitigation measure will have to be properly laid out in such a study. As development of a specific site for generation of electricity entails exploiting natural resources of the nation, it is the general practice to charge a royalty from the developer. The law needs to stipulate such rate, if it is decided to levy a charge for the use of the country’s natural resources. In order to entice private investors to invest in hydropower project in the country, various tax breaks are given to them by the concerned governments. For the construction and erection of a hydropower plant, a developer will need to import substantially from foreign countries. The practice is to exempt import duties on such imports, like custom duty, value added tax, etc. Similarly, even income tax is waived on the income from hydropower project to attract investment in the sector. The law to be promulgated needs to list such facilities, if it is decided to provide such facilities. In order to encourage private investors to develop hydropower projects, provision will have to be made in the law for the utility (DABM in Afghanistan at the moment) to purchase the electricity generated by such project in bulk. The PPA will have to be for a relatively longer term (20/25 years) in order to mitigate market risk that a developer will face. Similarly, arrangement will also have to be made to purchase all the energy by the utility such that the project does not face revenue risk. Without a provision for such a PPA, private sector will not participate in the hydropower development enthusiastically. In view of the financially weak position of DABM, the developers will be facing payment risk, in as much as DABM’s ability to pay is concerned. In such a situation, no private sector will be willing and able to mobilize fund for the development of a hydropower project, nor will be willing to invest her/his own money by way of equity participation. Therefore, in the initial phases the law will have to make provision for sovereign guarantee of the PPAs till such time DABM becomes financially sustainable. An investor from a foreign country will need to be able to repatriate return on her/his investment back from the host country as well as the investment itself after a specific period of time. Therefore, in order to attract foreign investment, the law will have to specifically provide for repatriation of return on investment and proceed of sale of ownership stake in the power plant as well as repayment of principal and interest thereon in case of debt. Similarly, provision in the law will have to be made for the issue of visa to the foreign investor and her/his representatives/staff, under a simplified visa procedure. Foreign investors do not seem to be comfortable if an opportunity to choose governing law is not afforded to them. They are not familiar with law and judiciary of the host country and in order to make them feel comfortable the law should make provision allowing the foreign investor to choose foreign jurisdiction. This will entail using the law of the foreign investor’s choice for settlement of dispute – either by way of arbitration or through judiciary. Development of a hydropower project is a multi disciplinary undertaking. The investor will have to deal with authorities related to forest, transportation, finance, trade, etc. for various permits and approvals. They do not like to get entangled in the red tape of the bureaucracy. It is incumbent upon the government to have its ministries and departments work expeditiously. For this purpose, in many countries, the institutional structure is streamlined to set up dedicated government unit styled as “one window.” It is recommended that the proposed law make a provision for such an institutional mechanism. As hydropower is both capital intensive with high initial investment, a developer will never invest all money required for the project from her/his own sources. Between 70-80% of the cost is funded by debt from financial intermediaries (FIs). This requires perfection of security on behalf of the debt providers. Besides, due to the size of the funding, debt is not, generally, taken on the basis of collateral or guarantee. Hydropower is generally financed on “project finance” instrument under which the project, under construction, itself is accepted by the FIs. This will entail lodging the project license, PPA, public land lease agreement and other intangible assets as the collateral. The law will have to take cognizance of this and allow assignment of project license, PPA, public land lease agreement and other intangible assets in favor of FIs. Venturing into hydropower sector amounts to undertaking various risks ranging from design risk, construction risk (including cost/time overrun risk, force majeur risk), erection risk, marine risk, etc. on the part of the developer. This necessitates well developed insurance market in the country and provision for re-insurance in overseas countries. The law will need to make necessary provision for the purpose. There are already plans to set up a regulatory entity. The mandate of such an entity needs to be broadened to regulate the rate that is set between an IPP and the energy off-taker. Such entity needs to set lowest rate consistent with long term economic health of the developer as well as a reasonable return on investment. The factors that need to be taken into account in setting the rate include cost of the physical plant, operation and maintenance costs, financing cost, replacement costs, plus a decent return in equity. The above is in addition to the role of a regulatory entity with regards to health, safety and environment as well as customer service. The prevailing law on Usage of Electricity basically defines the relationship between DABM and its consumers. Therefore, it is recommended that this law is left alone and a new law is promulgated to attract private sector participation in the development of hydropower and to regulate the same. In one decade the installed capacity doubled from 300 MW to 600 MW in Nepal. It had taken 85 years to generate first 300 MW. The credit goes to a set of policy and law geared to attract and encourage private investors to invest in the hydropower sector. Liquidity is no problem in Afghanistan today. Besides, the market for the electricity is already there. The only missing piece is the legal environment. Once an appropriately designed and structured law is put in place, private sector will start playing an active role in the hydropower sector in Afghanistan, too. Electricity is a vital service in the economy; it is an input in the production of nearly all other goods and services, and it is also an important final good, consumed by households. The Transitional Islamic Government of Afghanistan recognizes that the electric sector is essential to achieve the nation’s reconstruction and development goals. Electricity is the backbone of the economic recovery and availability of reliable power will help stimulate economic growth, raise living standards and restore the traditional sense of community and common purpose that unites the Afghan people. A reliable power system is essential to providing basic services, in attracting new industries, retaining existing ones, and bringing back to the country those that have left. Even though the country’s nameplate capacity remains at 454 MW, the actual production is around 240 MW, due to the damage and lack of maintenance of the generation plants. To accomplish the above vision, the MWP has planned, over the next few years, ambitious projects with the goals of rehabilitating its existing infrastructure, increasing its generation capacity through the participation of the private sector, steadily increasing the number of customers it serves, establishing more appropriate tariffs, and increasing its revenue through enhanced and effective billing and collection and loss reduction procedures. The MWP also recognizes the pressing need to develop institutional capacity and tools that would allow it to effectively manage the reconstruction efforts of the electric infrastructure. The purpose and objectives of this policy is to provide the organizational structure and the legal and regulatory framework which would allow the MWP to accomplish its vision, while at the same time transforming the power sector into a commercially viable and stable sector that attracts and retains private investors. The Government supports the liberalization of the electricity sector, through a combination of competition and regulations, as market forces. The government, where possible, will encourage the joint use of its physical electric infrastructure to provide other services. Where joint use is possible, the MWP intends to competitively price the cost of providing and managing these services. To encourage and attract private sector involvement, and to provide for the safety of customers and environmental stewardship, the government will develop a regulatory framework and will introduce law that would create an independent electricity regulatory entity. • Represent the government of Afghanistan in electricity matters pertaining to regional interconnections and international organizations. The sector would be restructured by (i) separating the utility functions (generation, transmission and distribution/sale of electricity) from sector policy and planning functions; (ii) strengthening the role of MWP in preparing and implementing sector policies, coordinating donor programs, and improving governance in the sector; (iii) establishing an independent regulatory entity, which would set technical, financial and operational performance standards and regulate the power sector; and (iv) developing feasible options for handling certain non-core functions which are currently being handled by MWP or by government enterprises controlled by MWP. • Da Afghanistan Breshna Mosssesa (DABM), which is responsible for the operation & maintenance for generation, transmission & distribution, and sales of electricity. • New & Renewable Research and Development Center, which is responsible for the research and introduction of devices that use new and renewable sources (solar, wind, biomass, micro hydros). • Spinghar Construction Unit, which is responsible for the civil works for substations, power stations, and other facilities. • Power Construction Unit, which is responsible for the erection of power stations equipment, transmission and distribution lines, and substations. The role of MWP will be redefined to cover (i) the preparation and execution of sector policy and planning; (ii) preparation of the legal framework for the electricity sector (in coordination with other Ministries); and (iii) coordination of donor programs and activities. MWP will no longer be responsible for the day-to-day management and operation of the public enterprises. MWP will seek expert services and advice for strengthening its policy making role, as well as for enhancing staff capabilities through training and other institutional development programs. DABM is responsible for the generation, transmission, distribution of electricity, operation and maintenance of assets, sales of electricity, and revenue collection. As a first step to separate these utility functions from MWP, a new Board of Directors will be constituted. This Board would include representative(s) of the Ministry of Finance, which is the owner of the enterprises, the MWP, and other relevant stakeholders, and will ensure that the public enterprises will operate in accordance with commercial principles. Presently MWP (and/or DABM) also perform some activities which are normally performed by the private sector, and can be acquired on a competitive basis by the electricity sector entities. These include Power Construction Unit, Spinghar Construction Unit, a Pole Manufacturing Plant, Water and Power Electricity Consultants Authority (WAPECA), and the New & Renewable Research and Development Center – which handles research and pilot programs for promoting new and renewable sources. The Government intends to (ultimately) divest these functions to the private sector. Today, no legal and regulatory framework exists in Afghanistan. Tariffs settings, one of the basic functions of a regulatory agency, are done at the MWP. There is no provision for private participation in the power sector. The government intends to create a legal and regulatory framework by establishing an electric regulatory entity. This regulatory framework would: (i) establish a licensing/ authorization process that would regulate and attract private investments; (ii) create and design electricity tariffs, and (iii) create a process that would ensure consumer safety, protection, and environmental protection. • Ensure consumer protection, safety, and environmental stewardship. • Establish a high-level Reform Task Force to lead the sector restructuring process. The Reform Task Force, chaired by the Deputy Minister for Power and reporting to the Minister for Water and Power, would be established in MWP. It will engage consultants/experts to: (i) advise on, prepare, and implement the restructuring of DABM into independent entities responsible for the generation, transmission and distribution/sale of electricity; (ii) conduct public relations and information campaigns to develop support for the restructuring and reform program among employees, consumers, and other stakeholders; and (iii) prepare policies and recommendations for enhancing the commercial viability of the new companies/entities. The Task Force will also identify the legal and other constraints (if any) which preclude the divestiture of non-core functions to private owners/operators, ascertain whether any staff of these entities can or should be accommodated within the MWP or DABM, and develop suitable social programs (early retirement, training, outplacement, etc) for handling the remaining staff of these entities. This report was submitted to Afghan Government in April 2007 through Deutsche Gesellschaft fur Technische Zusammenarbeit (GTZ) GmbH, Afghanistan. 2. The Ministry of Electricity and Water (MEW) categorizes hydropower projects as follows: Micro Hydro 0-50 (kilowatts) kW, Mini Hydro>50 kW≤500 kW, Small Hydro >500 kW≤5000 kW (5MW), Medium Hydro >5 MW≤50 MW, Large Hydro >50 MW. 4. A list of people consulted is in Appendix 3. 5. In December 2004, the Government created the Ministry of Energy and Water (MEW) by reorganizing the responsibilities of the Ministry of Water and Power and the Ministry of Mines and Industry. The responsibilities of MEW are set out in the Government's Enterprise Act. As a result of the merger, MEW is responsible for, gas, petroleum, and water resources; which is the power sector. 8. As the “Hydropower Development Policy” was first developed in 1992 only in Nepal, the concession period of most of the projects will expire only next decade. Under same format Norway also developed its hydropower and Norwegian government now owns a clutch of hydropower projects that were handed over to it by the initial private developers. 9. In Nepal the environmental flow requirement is 10% of the dry season flow.